You might have heard that sourdough bread takes all day to make. But it doesn’t have to be this way. Especially if you want to bake a good, simple loaf that is not sour at all. 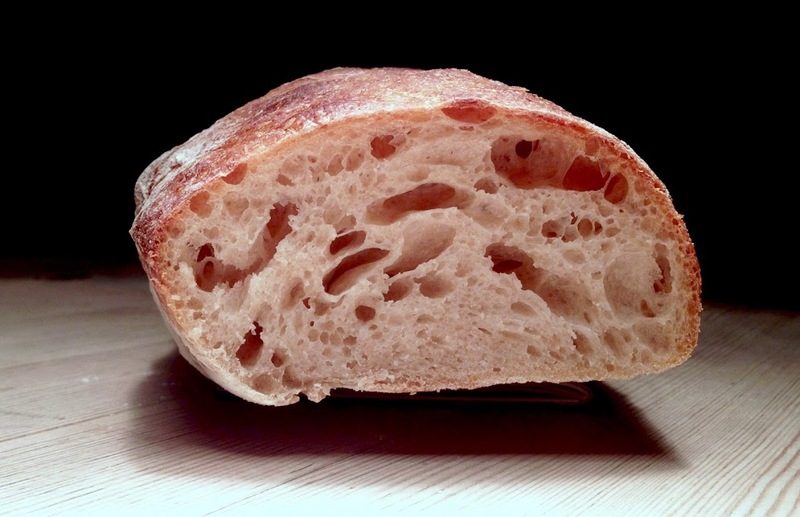 Today’s recipe might be the perfect start for the novice sourdough baker. I recently borrowed a baking book from the library by one of Denmark’s master bakers, Nikolai Skytte. If you ever get to visit Denmark and drop by either Emmery’s or Meyers bakeries, you’ll be able to taste some of the breads he has developed. He’s a passionate baker, and knows his stuff. During the first four days with the book I baked some gorgeous sourdough foccacias and this simple, fast, fuss-free loaf. Compared to the original recipe I have used wholegrain Ølandswheat instead of standard whole grain wheat. I must say, this is a lovely loaf, mild in flavour with a brittle crust and crumb like a chewy pancake. Big holes might not be perfect for marmelade, but with a salad or with some salami on top it’s great. The loaves are fairly small, like big, chubby baguettes. Pour the dough on to the table and divide it carefully in two halves down the middle. If you need to tighten up the dough, do it carefully, so you don’t knock out the air. This shot is from my second attempt, this time with a brand new sourdough starter.